Kenix Kwok who is 5 months pregnant accepted a radio interview earlier accompanied by Frankie Lam. There were rumours that claimed she is retiring from the entertainment industry after giving birth. Frankie said "It's my wish. But as a couple we respect each other. I will respect her decision". Kenix stated that it was too early to say. Frankie also exposed that every night he would touch Kenix's tummy and speak to their Baby. He laughed and said "It is quite silly doing that." Lol, I think Kenix seems to be too ambitious to retire right now. 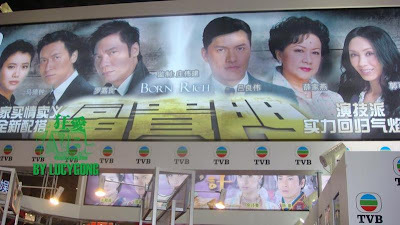 I'm currently watching Born Rich both in Chinese and with English subtitles. However, I'll wait until I'm done with the series in Vietnamese then I'll do a review. I'm enjoying the series although I don't think it is living up to expectations as an anniversary series. Kenix is having a very refreshing role playing a psychotic, obsessive woman who is crossing all boundaries to make her world of fantasies happen in real life. I also enjoy watching the veterans very much. Ray, Jamie, Gallen, Anita, Joe, Nancy, etc... That's what I call true acting. With the early passing of her mother, Ling Chi's father (Lau Siu Ming) puts all his love on his precious daughter. Ling Chi graduated from law school at the age of 23 and began her internship at a law office. During this time, she met and fell in love Cheuk Yat-yuen (Ray Lui) who is betrothed Ho Tseuk-nin (Jamie Chik). Ling Chi always thought that Yat Yuen would leave Tseuk Nin to be with her but he chose to marry his fiance at the end. Devastated, Ling Chi went to England to forget the past. By looking at the pictures, I could guess that Savio Tsang must play a part in the Tung family and after reading this synopsis, I bet he is Ling Chi’s fiancé. The scene that they shake hands above must be one of the early scenes when Ling Chi just comes back to HK. I cannot wait to watch their sparkles! I translated this from a Vietnamese translation so I'm not sure how accurate this is. I find it unbelievable that Ling Chi can graduate from law school by the age of 23. Perhaps she graduated with a B.A. and then went to law school and perhaps had her summer internships. Thanks to Miki @ DAN for the translation. 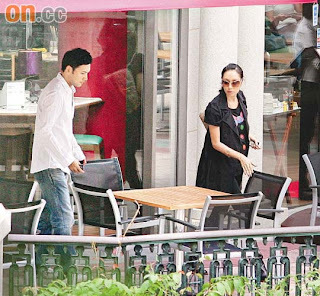 Kenix Kwok is 5 months pregnant and the ultra sound showed that it is going to be a girl. She is having the baby delivered by Caesarean Section next February. Kenix attended TVB publicity and charity gala for "Born Rich" yesterday, wearing a 4 inches high heel shoes. Since husband Frankie is not in the cast, he was not there to look after her. When Kenix arrived at the gala, she was being spoilt by many colleagues. First one to take her hand was her senior Lau Siu Ming, followed by director Chong Wai Kin who took a chair out for her to sit down when they had a group photo taken. Ray Lui, Joe Ma and Nancy Sit all went up to her to ask how she was. Kenix said she was a bit embarrassed. Last month when Kenix accepted an interview by MingPao, she was already 4 months pregnant, but the photo showed her looking more like 5-6 months pregnant. Last night, she wore a red dress, but it didn't show her tummy that big. It could be the angle of the picture which was taken last month. Some cast members were worried about her wearing a 4 inches high heels, in particular, the males who kept reaching out their hands to help her. Kenix explained that she only put on her high heels since she arrived, and she was wearing a pair of flat shoes beforehand. Kenix stressed that her high heels shoes are very stable, and they are very safe. Talking about the changes that she has to make since she is pregnant, Kenix smiled "I put on 10 pounds in weight, and my bra size has gone up one cup. Otherwise, everything is normal. Sometimes I crave for certain food, like if I want to eat cheung fun, I ask Frankie to get it. " (Do you know if its a boy or girl?) The ultra sounds showed it is a girl, and her face is round with a high nose. The doctor said her brain development is very healthy. "(Do you like baby girl?) I don't mind, I thank God for carrying a baby. (Wiil Frankie be there when you are in labour?) Sure, I am having a Caesarean Section in February, we have been thinking a few names to call her." Talking about the rumor that Kenix will retire from the entertainment industry after her delivery, Kenix said "It is hard work in this industry, and it is time consuming too. I don't mind attending any functions or doing some light commercials, but it is hard to tell. You never know what will happy next." For the coming "TV Queen" award, Kenix thought Sheren Tang looks promising. Watch out on those heels, you pregnant woman! I found this link in Frankie-Kenix's Chinese Forum. Is Kenix dead? It looks like she is to me, especially when she has that white blanket on her that must have been uncovered by Ray. Either she's seriously wounded or... dead from the car accident. I just pray that the script didn't give Kenix the latter ending. But there's a glimpse of hope: the GRAND wedding. If she will die, I don't think the director would have wasted so much time and effort filming that wedding scene on the ship. That was just my two cents. I don't mind Kenix's character dying (yeah right!) but I do dread that Ray will get back with his wife Jamie after Kenix's death. That will totally ruin the perfect love story. On a side note, I haven't seen such a casual and relaxing scene of Kenix for a long time. I found this clip on Youtube & it really brings back memories. The person singing the song is different and doesn't sing as well as the version I have. This is one of my favorite songs from all the Journey to the West classic songs. The maker of the MV did a good job adding the last part of Xuanzang rescuing Sun Wu Kong. It really "completes" the sad story. 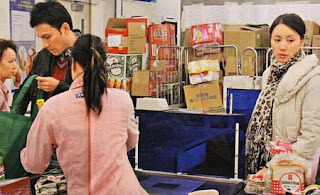 Sophisticated banker CHEUK YAT YUEN (Lui Leung Wai) mistakes con artist SA FU LOI (Lo Ka Leung) for his half brother CHEUK YAT MING, fortuitously elevating the swindler to one of the leading figures in the banking industry. 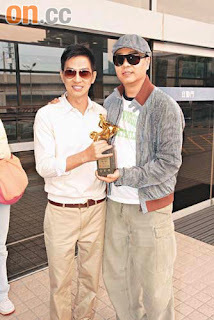 The lost and found brotherhood has blinded YUEN to FU's real nature and intentions. YUEN is kidnapped overseas by a group of rioters. 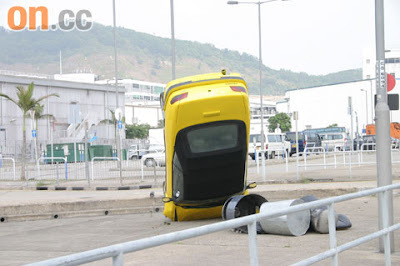 He undergoes a dramatic personality change after the incident. YUEN's wife HO TSEUK NIN (Chik Mei Chun) has tried her best to console him but still cannot help him get over the unpleasant experience. Longing for more comfort and support, YUEN gets back with his ex-lover TUNG LING CHI (Kwok Ho Ying). NIN is heartbroken to learn about the affair and it has left the broken mirror that can't be mended. The identity of CHEUK YAT MING gives FU not only a sense of family warmth but also a sweet taste of romance. He finds himself in love with YUEN's little sister CHEUK YAT SUM (Yuen Wing Yi). SUM is attracted to FU too but thinking that they are true biological siblings, she decides to keep her love under wraps and stays with her long-term admirer KO TOK MAN (Ma Tak Chung) instead. This comes as a huge blow to FU. He is not willing to lose his love, but neither can he reveal his real identity. Caught up in the dilemma between love and money, FU finally chooses the fortune road of no return. It is all about a tough battle for money, a devious triangle of love, and a severe challenge to ethics. Series sypnosis credits to Astro on Demand. Images credits to respective owners.